Throughout the United States, Stein is the premier source for slag aggregate products. Stein provides materials of choice for construction and architectural applications. With over 60 years of slag processing experience, Stein provides slag aggregate for a myriad of businesses with specific requirements. 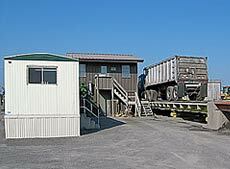 Locally owned and operated, Stein can work closely with customers to produce slag that best suits any industry's needs. Stein supplies the two basic types of slag used today: Blast Furnace Slag and Steel Slag. Blast Furnace Slag is the co-product of iron making in a blast furnace, while Steel Slag is a co-product of steel making in a BOF (Basic Oxygen Furnace) or EAF (Electric Arc Furnace). Blast furnace slag is used in a variety of applications including structural concrete, mineral wool, and glass manufacture. Steel slag also has numerous applications, such as an efficient non-slip choice for asphalt pavement where friction is desirable. All slag is crushed, screened and graded to specific sizes. Experts at processing slag, Stein delivers the right size and quality of slag for their customer's needs whether slag is needed for a road base shoulder or for a fire resistant masonry wall. For more information about the benefits of slag click here.